WASHINGTON - Orange juice maker Tropicana markets its brand as fresh from the grove, but a series of lawsuits nationwide claim the company's juice is so heavily processed it shouldn't be called "natural." In approximately 20 lawsuits, the first one filed in New Jersey, lawyers claim the company adds chemically engineered "flavour packs" to its juice, making it taste the same year-round. On Thursday, lawyers will come together in Washington to argue before a panel of judges about where the lawsuits should be heard as a group. 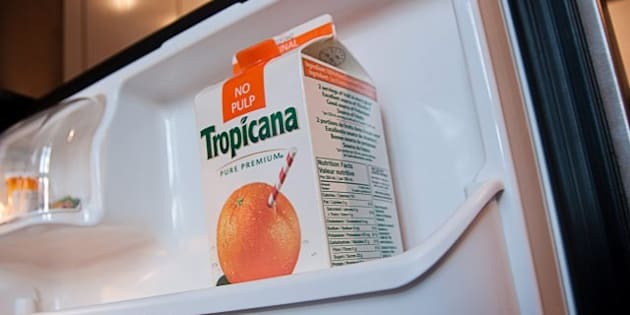 Tropicana declined to comment but said in a statement that it is committed to full compliance with labeling laws and to producing "great-tasting 100 per cent orange juice." The orange juice lawsuits are just the latest disputes over "all natural" claims. Over the past several years, a number of major national brands have been attacked for what consumers have called deceptive labeling. Tostidos, SunChips, Snapple and Ben & Jerry's ice cream have all faced similar attacks. The lawsuits have become common enough that the Grocery Manufacturers Association, which represents more than 300 food and beverage makers, had a panel that discussed the topic as part of a conference in February. Lawyers representing food and beverage companies have told their clients to be wary. Part of the problem, lawyers agree, is that consumers are looking for healthier products, and companies have responded by creating and branding their products as "all natural." The Food and Drug Administration, the agency that oversees packaged food labeling in the United States, has no definition of what counts as "natural." As long as a food labeled "natural" doesn't contain added colour, artificial flavour or synthetic substances, the agency doesn't object. "The whole natural issue is a mess," said Michael Jacobson, the executive director of the Center for Science in the Public Interest, a Washington-based food safety and advocacy group that helped get the makers of 7UP and Capri Sun to stop making natural claims about their products. Jacobson and others say the FDA's lack of guidance has left lingering questions. One question has been whether a product with high fructose corn syrup, which is made by processing corn but does not occur naturally, can be labeled natural. That was the issue in a 2007 lawsuit over Snapple drinks. Snapple has said it no longer uses high fructose corn syrup in products marked "all natural," and a New York judge ultimately ruled in Snapple's favour and closed the case last year, but other lawsuits are still questioning the use of the term. Many "all natural" lawsuits are still in their infancy, said Kellie Lerner a lawyer who is involved in the orange juice litigation and closely following "all natural" cases. Lerner said like the orange juice lawsuit, other similar lawsuits have sought class action status, where one or more consumers sue on behalf of all people who bought the product. The lawsuits could get dismissed or go to trial, but companies could agree to settle with consumers and offer product vouchers or rebates. The company that owns Ben & Jerry's and Breyers ice cream, for example, settled "all natural" lawsuits for $7.5 million earlier this year, providing customers who bought flavours like "Chubby Hubby" and "Chunky Monkey" cash rebates of up to $20. The ice cream company also agreed to change its packaging, and that's something lawyers involved in the orange juice lawsuit want too. "I'd like them to modify their marketing so that consumers can make an informed judgment on their purchases," said Stephen A. Weiss, a lawyer involved in one of the lawsuits against Tropicana. The Tropicana lawsuits are partly the result of a 2009 book about the orange juice industry, Alissa Hamilton's "Squeezed: What You Don't Know About Orange Juice." Hamilton, a doctoral student at Yale when she started researching orange juice, spent five years learning about the industry, interviewing Tropicana employees, growers, farmers, and others. Hamilton, who has consulted with one of the firms involved in a Tropicana lawsuit, said she would like to see Tropicana be clearer in its labeling and stop using words such as "fresh," ''natural" and "pure." "It's not simply orange, it's complicated orange," she said. "I'm just trying to advocate for more honesty and more transparency." Follow Jessica Gresko on Twitter at http://twitter.com/jessicagresko .